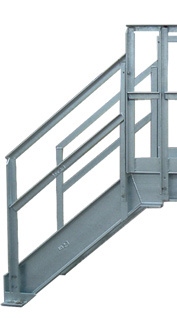 Pipe and Dike Bridges provide a safe and efficient means of crossover for workers who must cross piping, dikes, containment walls, conveyors, production lines, or any other areas that require over the top access. 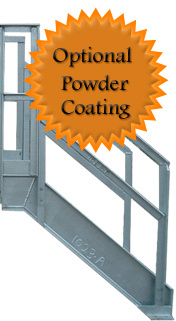 Optional finish coats include: standard red oxide primer, powder coat finish, or hot dip galvanizing. 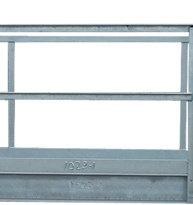 Each bridge is constructed in three major components/sections to reduce set-up time. 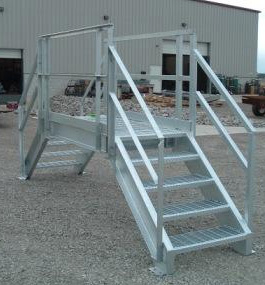 Our crossover platform bridges can be assembled by your plant maintenance personnel with the aid of assembly drawings in approximately four man hours after installation of the foundation.